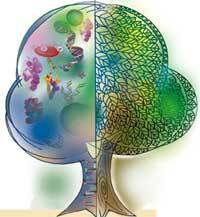 Every organism has two aspects: phenotype and genotype. Phenotype refers to the physical and behavioural traits of the organism and genotype to its internal, genetic composition. The relationship between the two has been for long the subject of fierce -- and sometimes intensely acrimonious -- debate, popularly known as the nature-nurture debate. Those who favour nature stress the primacy of genetic material in shaping the phenotype, while proponents of nurture favour the primacy of environmental factors of both the physical (quality of air, food, water) and cultural varieties. The former builds on the theories of heredity and evolution first propounded by Charles Darwin. The truth resides somewhere in between because environmental factors are also known to influence an individual's phenotype. Take the example of the body's circadian rhythm -- the 24-hour cycles of various processes (such as hormone secretion, urine production) essential to life. This rhythm was believed to be dependent solely on internal factors, which in turn are determined by specific biochemical reactions occurring at the cellular level. But according to a new study, environmental factors may also influence cellular reactions either through genetic mutations (see box: Genetic noise) or by impeding the production of chemicals required. Led by bioengineering professor Jeff Hasty at the University of California at San Diego, La Jolla, usathe study was based on a classical model called Gillespie algorithm. The model simulates biochemical reactions in the cell, which are controlled by enzymes. The scientists modified this model to evaluate the combined effect of genetic mutations and delays in biochemical reactions on the phenotype (normal growth and behaviour). "This analysis of gene regulation extends earlier explanations of the observed variability of cells," says Hasty. The paper was published in the Proceedings of the National Academy of Sciences (Vol 102, No 4, October 11, 2005). Computer virus The scientists say environmental factors may act as a "virus" to alter genetic instructions in much the same way that a virus acts in a computer -- altering the instructions wired into programmed software. Given that the coupling of the 24-hour circadian rhythm and the external environment can be crucial to the survival of an organism, the results may lead to new insights into the importance of the synchronisation of genetic mutations within the day-night cycle. "Our analysis provides a framework for addressing the role of noise and time delay in the generation of biological rhythms that are extremely important in many contexts," says Hasty. The research supports the popular view that genetic constitution specifies the potential development of an organism's phenotypic expressions and environmental factors determine the manner in and extent to which this potential is reached.